python-catalin: WinPython - news and old stuff. WinPython - news and old stuff. First good news: the team tells us about the WinPython will come with new release of WinPython. This will be 3.4.3.7 version of WinPython and this will be great for most of users. I love this portable python because first is easy to use and can easy test my python scripts. One goal of this portable python it's the demos. 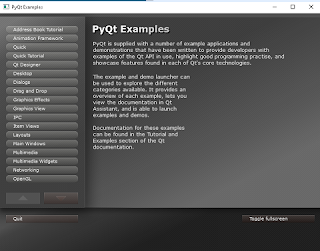 I found some great demos with PyQt4 and networkx. Also you can use Spyder to make your python scripts. It's a free open-source development environment for the Python programming language. This visual interface similar to MATLAB where you can run commands, edit and debug programs, check the values of variables and the definitions of functions, etc. If you just getting started with Python then just take a look at google.com/edu/python. Also you can use Jupyter Notebook web application.